‘You see this scarf?’ she said. Gideon nodded mutely. They had crossed the street so that she was in sunlight, and he could not think how he had paid her no attention until now. 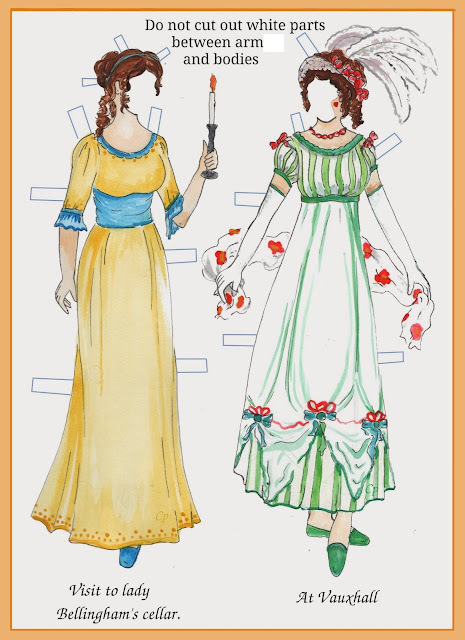 She wore an afternoon dress of primrose yellow with a pretty and intricately fashioned shirtwaist. The scarf was a delicate ivory-coloured thing, folded about her shoulders so as to catch the bright spill of her hair. These were finer clothes than she could have afforded, he knew – finer, certainly, than his own – and no doubt she had gone to some trouble even to come by them for the day. commentary: A rule we could all live our lives by. Angela Tatton is very much below Gideon, classwise, in 1890s London, and he - young and callow – can’t admit how bewitched he is by her: he is, of course, going to help her, raise her up. In Half Moon-street, just as she came near to the house, Esther Tull felt the first gentleness of the snow. (How could you not want to read on…?) Esther is going to take a gruesome and violent action. She is obviously trying to draw attention to something, some wrong-doing, but what is it? Mr Carew stated that Miss Tull examined soon after her expiry by Prof. Caldicott of Univ. College London, the latter being the family physician and great friend of Lord Strythe. Insp. Cutter responded that Prof. Caldicott might have treated Her Majesty’s own piles, but had not attended on the deceased prior to death, which must therefore be notified to the coroner. So this excellently mis-matched couple – Gideon is actually a Divinity student – continue to look into various deaths and try to find out what happened to some missing women. And the answer is truly horrible and spooky and terrifying. And somewhat hard to classify - it is not entirely clear what kind of book this is, which is all I am going to say. The climax on the eponymous Vesper Sands is a scene of jaw-dropping complexity and brilliance. The House on Vesper Sands is beautifully written, very funny when not being scary, and summoning up late-Victorian London in all its sooty glory. Towards the end of the book – in a scene that makes us hope this is the beginning of a series – a young woman and Inspector Cutter look out at London. So clever, so full of light and dark. Paraic O’Donnell chose his favourite modern novels about Victorian London in the Guardian last week – an interesting list. They're going to confirm this shrieking Gilead f***lord even if he coughs out flies and crypt dust, aren't they? On the whole I avoid politics on the blog, particularly the politics of another country, but this Tweet was the only thing to cheer me up and make me laugh during the whole procedure. Pictures from the NYPL collection of 1890s fashions. Oh, I love that Tweet, Moira! Just priceless! Thanks for sharing it. As to the book, it does sound like a good read. I really got a sense of place and time, just from the short bit you shared. And an author who can use dark wit effectively is impressive. Glad you enjoyed it. Priceless is just the word, Margot. And yes an enjoyable -if slightly un-definable - book. Hmm, not a massive fan of Victorian settings, so I'm out. Glad you enjoyed it though. Fair enough, find something modern with a car chase! Well, I am dithering here. The scary bits scare me away, but anyone who can write that tweet is someone who should be read. I have some time to think about it while it decides to be available and affordable here. I love the drawing at the top. So glad you like the picture! I was searching a while through pics from the right era, and the moment I saw that one, I loved it. If you get the chance, take a look at this book. I think you would enjoy it.